When the Clean Power Plan was announced in June 2014, EPA issued proposed carbon reduction goals using a rate approach (pounds of CO2 per MWh of electricity generation), but indicated that states would have the option to convert these rate-based targets to mass-based targets (pounds of CO2). Yesterday, EPA released further guidance on how states might translate the rate-based goals to mass-based equivalents. Two potential approaches have been proposed: one focused on existing units alone, and another that accounts for load growth and includes emissions from new or incremental fossil fuel generation. The “Existing Affected Sources” approach calculates a generation level for each state based on existing 2012 fossil, renewable, and at-risk nuclear generation, and multiplies this value by the previously determined rate-based target to develop a goal in tons of CO2. 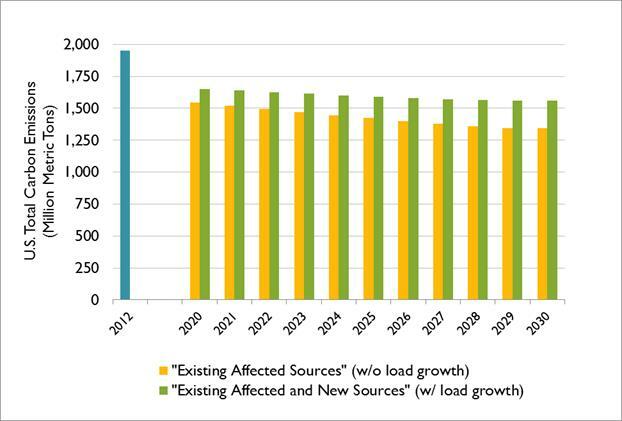 The “Existing Affected and New Sources” approach is more complicated, as it accounts for load growth. It uses projected sales based on region-specific load growth rates from the EIA’s 2013 Annual Energy Outlook, multiplied by a transmission loss factor, and adds these adjusted sales to the generation assumed for the “Existing Affected Sources” approach. This approach assumes that all new or incremental generation to meet load growth comes from new fossil generation within the state in question. Figure 1 (below) compares the sum effect of these two approaches on nationwide emissions against 2012 emissions. By 2030, the “Existing Affected Sources” approach reduces 2012 emissions by 608 million metric tons, or 31 percent of 2012 emissions. In contrast, by 2030, the “Existing Affected and New Sources” approach reduces 2012 emissions by 391 million metric tons, or 20 percent of 2012 emissions.